I made a big effort to finish a lot of products that I'd half used and after looking at everything at the end of the month, I think I did quite well! Also as well, I'm continuing to answer the "Would I re-buy" question as well as it made these posts a little more interesting! Garnier Ultimate Blends Conditioner. 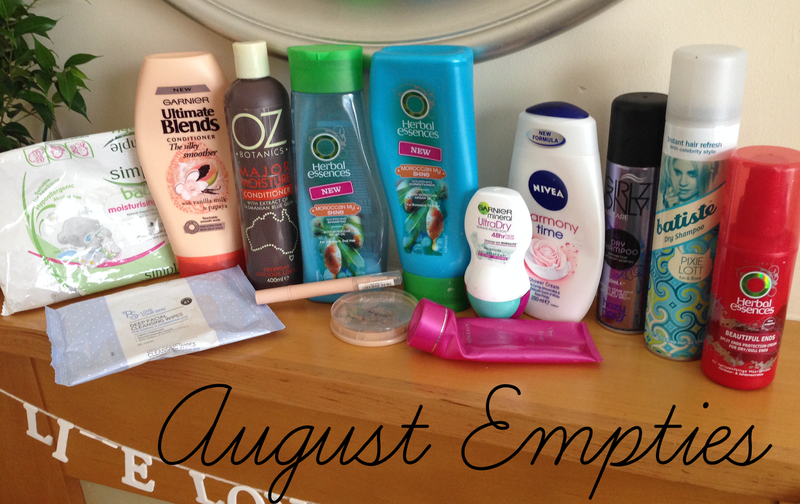 I really liked these products. ALOT. It smelt great and I actually noticed a difference in my hair and how soft it was. Obviously many girls will agree, you finish conditioners a lot sooner than you do the shampoo so I still have a little left. I know they're quite new and so a lot of stores have them on offer for just under £2 but they're well worth the money. Would I re-buy? Yes Definitely! Herbal Essences Morrocan My Shine Shampoo and Conditioner. Another great shampoo and conditioner! The smell once again is amazing but this time this product contains my beloved Argan Oil! The bad part is that I didn't really notice my hair was any different and I still had to apply the same amount of hair care products after I got out of the shower. Would I re-buy? Probably, but maybe only if they were on offer. 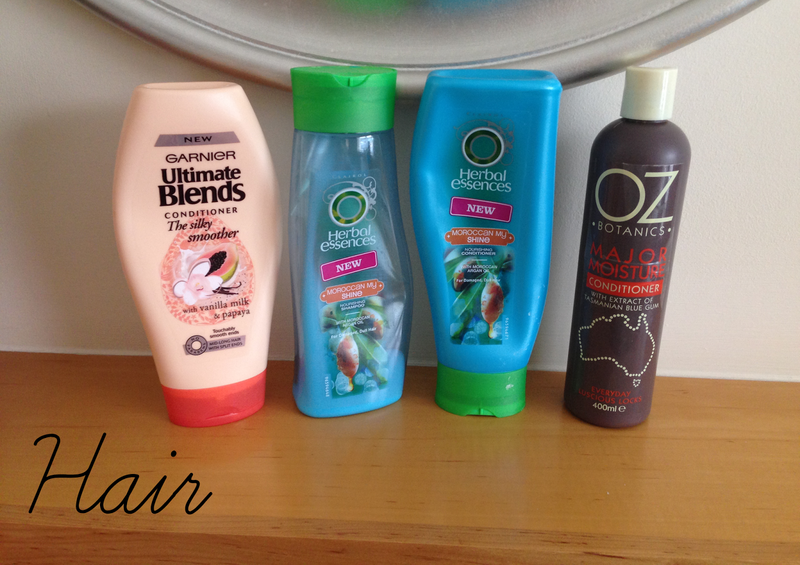 OZ Botanics Major Moisture Conditioner. Another bottle of conditioner that got lost along the way. I brought it from Poundland months ago and it's always been a "spare" kind of product that I use when I haven't got anything else. It smelt a bit too sweet for me and it was so runny that it didn't really feel like it was doing anything at all to my hair. 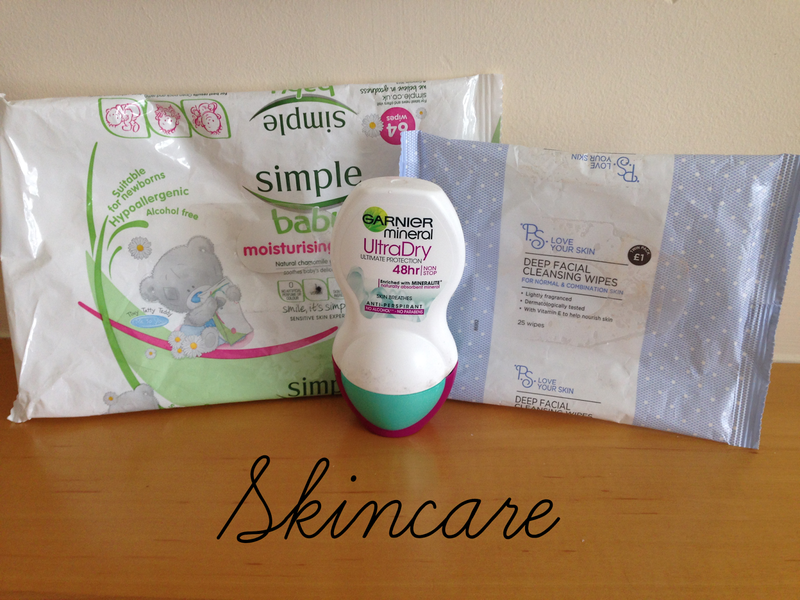 Simple baby wipes. I have actually lost count on the amount of times I've brought these wipes. They're always at my local Poundland and they can last me a good 2 months! They're perfect for taking my makeup off before moisturing and I actually like to buy another pack to keep in my car just incase! Would I re-buy? Of course, I only yesterday went and brought me a new pack! Primark Love Your Skin Deep Facial Cleansing Wipes. Primark's trusty twin packs for £1 have had a recent face life and I think they're loads better! I don't tend to use these for my face but they're always good to have around! Garnier Ultra Dry Deodorant. Boring but everyone needs it! I don't really have a particular deodorant that I always go to, I like to try out new ones but I was quite impressed with this one. It smelt really nice and it lasted throughout the day. 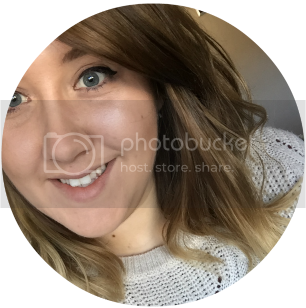 Rimmel Stay Matte Pressed Powder. I brought this a few weeks ago and I didn't start using straight away. After using it the once though, I was hooked. 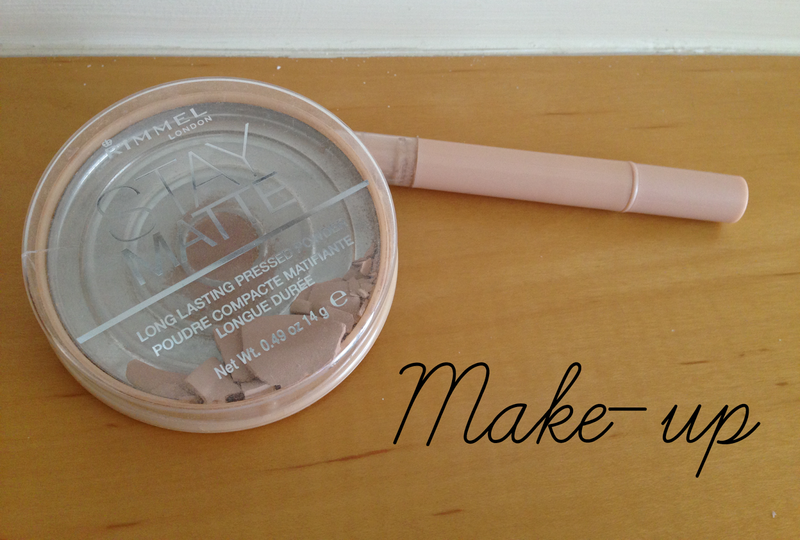 It was such a good powder and it really did keep my face looking matte. Would I re-buy? Yes, I've already brought a new one! Collection Illumination Touch Concealer. I really enjoyed using this concealer as it was quite multipurpose as I also used it as a highlighter. The packaging was a bit naff as all the wording came off and rubbed onto my other makeup! Fail! 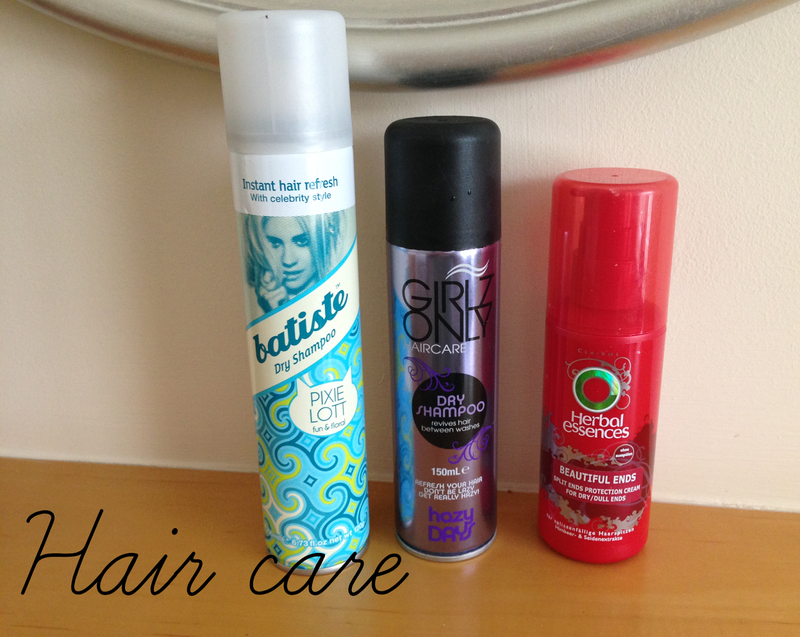 Batiste Pixie Lott Edition Dry Shampoo. I LOVE this dry shampoo. Once again, it's another product that I've lost count on how many I've brought. It's their best scent in my opinion and I would always go back to this one. Would I re-buy? Yes! I already have brought a new one. Girlz Only Dry Shampoo. I'm not a big fan of this dry shampoo. The smell was a little over powering and it lasted throughout the day so I was always really grateful to wash my hair! Would I re-buy? Not really. The cheaper option isn't always the best! Herbal Essences Beautiful Ends Leave-in Conditioner. I've used this a few times and I think this is actually my third bottle as my local Poundland always seem to have them so I stock up when I can! I really rate Herbal Essence's leave in conditioners as all of the ones I've tried have always made my hair feel great! 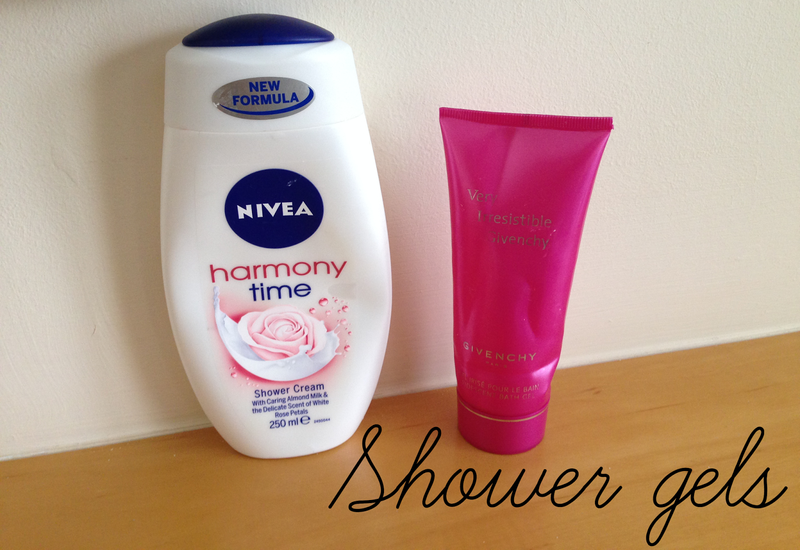 Nivea Harmony Time Shower Cream. Like deodorants, I'm not too fussy when it comes to shower gel/cream. I'll normally just pick up whichever bottle catches my eye but on one of my recent trips I decided to pick up the Nivea Harmony! I'm not keen on rose scents as I find them a bit too strong but this smelt SO nice! Would I re-buy? I already have a new bottle opened! Very Irresistible Givency Shower Gel. I've had this for such a long time and honestly, I've been scared to finish this. The Very Irresistible Givency fragrance is probably my most favourite and this was the last thing I had remaining from a set a few Christmases ago! Would I re-buy? I probably wouldn't buy the shower gel again but I would definitely buy the perfume again!